I haven’t been as intrigued by an artist from a different era since I heard Nick Drake for the first time. Like Drake, I ran into Ed Askew during a YouTube black hole adventure one afternoon. I can’t even recall the channels I traveled to even click on a video from Askew, but it happened, and I’m grateful. Ask the Unicorn, Askew’s first album from 1968, is a gem, though one that most don’t know. It’s great and should be required listening for anyone diving into the 1960s. There was a follow-up album, Little Eyes, to be released, but it sat, gathering dust, and didn’t see the light of day until 2003. A Child in the Sun is a mixture of fabulous songs from both of those records, like “Red Woman,” “Peter and David” and “Oh the Lovely Face,” performed and recorded at a public radio station in 1969–1970. The resulting product is a raw, unedited, unenhanced set of tracks laid out as honestly and refreshingly as artistically possible. The whole thing is just a guy in a studio, playing and having conversations. There are no elaborate productions, no mulligans. It is as straightforward as it gets. The variations from the studio-recorded LPs are slight and subtle. It is mostly the clearing of the throat, or a chuckle when Askew makes a mistake that’s noticeable. The album is like a live show in your basement just for you, and maybe the guy with the sound gear, but he only pokes his head in to ask a few interesting questions. Askew uses the tiple as his instrument of choice, and briefly speaks about the ordeal of getting strings for such an unheard of piece of equipment. The small ten-stringed guitar, almost like a ukulele, creates a unique sound that is a perfect fit for Askew’s voice and lyrics. 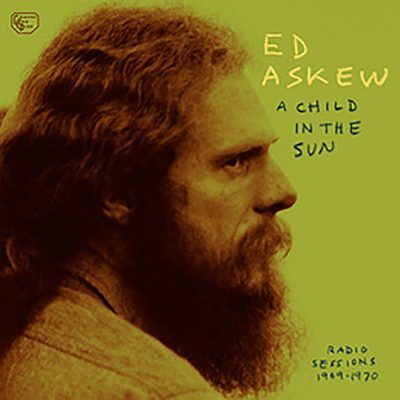 As high-pitched and raspy as Bob Dylan’s, a comparison that is likely very old-hat by now, Askew’s voice trembles over his melodies, quietly commanding one to pay attention. Another aspect of his music that resembles Dylan is his use of the harmonica in many of his tracks. I completely understand the association of Askew and Dylan, though I have a hard time with anything other than their limited vocal range and use of the old harmonica. Beyond that, it’s like comparing Robert Frost and Allen Ginsberg—saying they’re similar because both are poets. Having recorded Ask the Unicorn in the late ’60s, it is likely safe to say that Askew was influenced by Dylan, like everyone else was. But Askew brings a lot of things to the table that nobody else ever did—a lot. His lyrics are a trip, requiring a listener to strap in, to listen closely and associate them with whatever is applicable in their life.